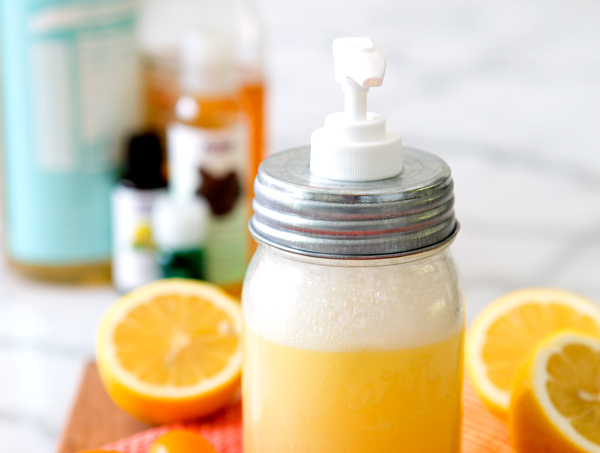 Yields approximately one pint mason jar of face wash.
– Combine purified water, castile soap, jojoba oil, honey, tea tree oil and lemon essential oil (IN THAT ORDER) in mason jar, mixing gently but thoroughly. – Prepare pump top if necessary by trimming to fit the jar (we had to cut about 1.5 inches off of ours). Screw securely onto top. – Use foaming face wash 1-2 times daily and remember to shake before each use as ingredients may separate over time! Liquid Castile Soap- All-natural, extremely concentrated soap made from 100% plant oils. Jojoba Oil-has a low comedogenic rating, ie not likely to clog pores. Raw Honey- Antibacterial agent and helps to gently eliminate breakout causing bacteria–can also help calm irritated skin. Tea Tree Oil-All-natural antibacterial, antimicrobial, and anti fungal agent that also helps preserve the face wash. Lemon Essential Oil-All natural-concentrated antibacterial agent, also aids in preserving the face wash.
– Combine sugar, coconut oil, and olive oil in blender. – Blend on low speed until mixture becomes a thick paste. – Add mango zest, lemon juice, and peppermint essential oil and blend on low for an additional 10 seconds. Scrape down sides of blender and mix. – Transfer scrub into an airtight container or jar. – The scrub should keep for several months. If you are worried about juice spoiling keep scrub in refrigerator. – Sugar – The benefits of a natural sugar scrub go beyond just cleansing skin – the healing, hydrating properties found in a sugar scrub are perfect for all skin types. Sugar scrubs can quickly help heal blemishes, absorb the dirt and oil from pores, and balance the natural oils in the skin. – Olive Oil – The antioxidants in olive oil help repair skin damage, soothe and relieve chapped, itchy and cracked skin and help rebuild the skin’s moisture barrier to prevent further moisture loss from occurring. – Lemon Juice – Is a natural astringent that also helps heal acne and remove blackheads. 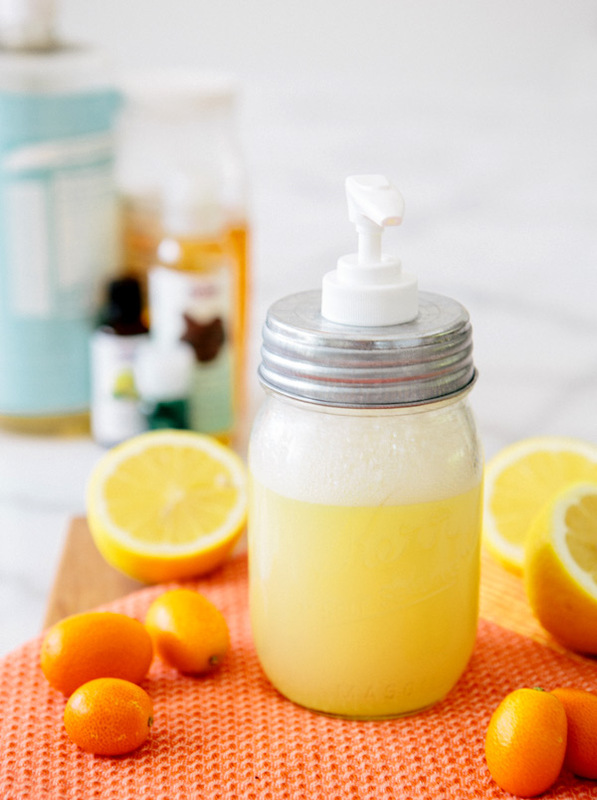 The citric acid in lemon juice will work to lighten dark spots and acne scars. – Peppermint Oil – Has anti-inflammatory properties that will work to soothe red inflamed skin. Peppermint oil is also able to provide relief from stress and depression when absorbed through the skin and can greatly increase overall energy levels, alertness and mental clarity! – Mango- The mango zest adds texture to the scrub and contributes to nourishing the skin through its natural properties. 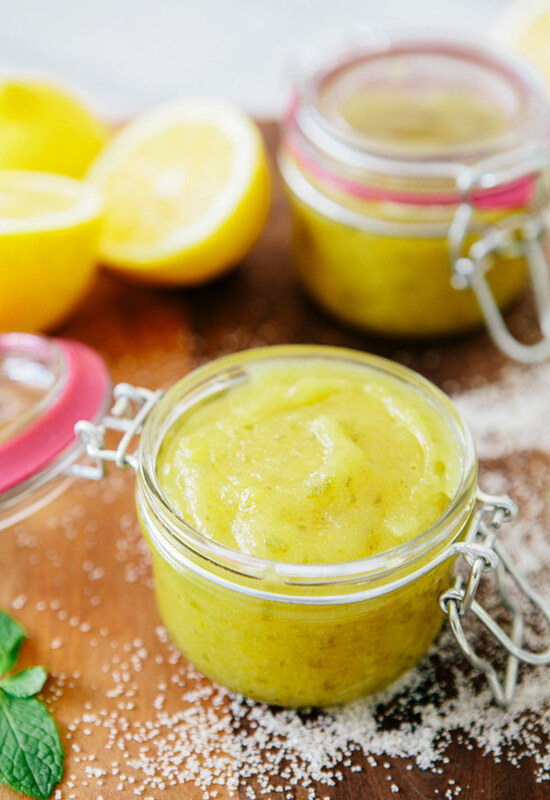 oh my gosh, that lemon mango mint scrub sounds good enough to eat! your photos are so beautiful sarah <3 i'd love to read a post on what equipment you use and your editing process. Hi Molly! Thank you! I will definitely keep that in mind! A quick answer though… I shoot with a Canon 5D Mark III, and my favorite lens for food is the 24-70 mm Canon lens, it’s so good. For style shoots we use the 85 mm 1.2, the 135 mm 2.0 and the 50 mm 1.2. As far as editing goes, that’s a bit trickier because I use photoshop and there’s no easy answer. But I’ll think on it and see if there’s a way I can share it! This is amazing! I've been doing a lot of research lately to find clean, yet effective beauty products. It seems like even the most "green" products still include some terrible chemicals. I'm definitely going to make this face wash. Thank you for making it so easy with all the helpful links! Any idea what the expiration is like on the face wash? Are you still using anything else (i.e. make up removing wipes) with this face wash as part of your cleansing routine? I love the sounds of that facewash! Totally making it this weekend thank you! I love this series Sarah, thank you! Sounds amazing! I really have to buy essential oils to make my own cosmetics! May I ask what you call mango zest? Is is the same as lemon, grated mango skin? Hi Nina, Yes indeed-grated, or zested mango skin! Yes, I'm confused about mango zest too. I've never heard that term used before on anything except citrus fruit & the skin of mangoes are paper-like in comparison. Could u explain pls? The recipes seem so fab, Idon't wanna mess them up. Both of these sound awesome. I love homemade home and beauty items. We have a homemade lavender bed spray that we use almost every day. Oh that sounds so nice Brittany! Lavendar is my favorite! Oh my goodness I love this home ec series!!!! 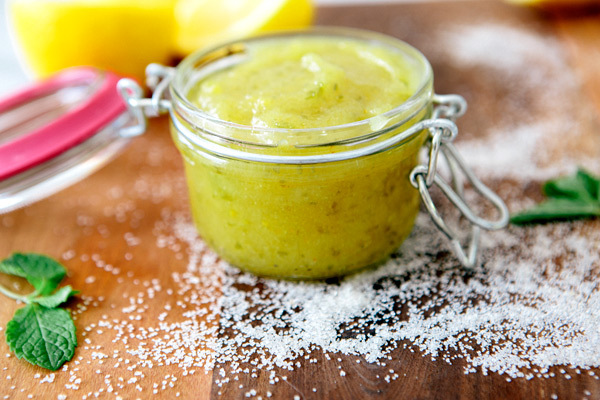 Fresh, homemade face wash in adorable mason jars… perfect summer project! Can't wait to try it this weekend. Thanks for the tip, definitely going to be giving this a try! Very cool. I've made a few things here and there, but I hope to try more. The items you've created sound like a great place to start. I agree, having to research a million products and ingredients is tedious and confusing and honestly not my favorite way to spend free time. In addition to your suggestions I thought I would also mention Doterra essential oils. They are top notch, pure and organic and the company provides great information on the healing properties of each oil. Hi Sarah! Love this post. I would love to make this face wash. How long will it be good for once made? these sound incredible! i love the pump lid mason jar, amazing. i've been using coconut oil on my skin for a while and i love it, but i love these other homemade options! great share! Hi Sarah! I’m a long-time reader and I’m so excited to see your recipes for natural beauty products – I’ve been obsessed with it lately, too – it’s just so gratifying to know that what you are putting on your body is fresh and natural. Looking forward to more! Just whipped up a batch of this, and I think I’m going to love it! The only variation I made was using the only castile soap I had on hand, which happened to be peppermint. It smells a little funky (peppermint + tea tree oil + lemon) but I love the texture and lather. Thanks for such a great idea! Can you replace the peppermint oil with actual peppermint leaf since the oil is fairly expensive for college/post-college kids? Or what about boiling it in the water to make a concentrate? I’m new to all the natural stuff so I hope everything goes well. When I made this, It was not “foamy” I wanted to know if maybe I did something wrong? I followed the correct measurements and the smell is also very potent. I just wanted to compare my wash with yours first to make sure i’m doing this right. I have a reaction to tea tree oil, especially on my face. What else could I use instead? My son has tinea versicolor and I was wondering if this may help because it has anti fungal ingredients. Do you happen to know if this is a good wash for him? I just made the foaming face wash, put it in a pump container but it does not make a foam! Any suggestions?